I've made this delectable choco cupcake over a month ago. But then I's in no mood to catch some good pics and so are the pictures :( . Seriously I's looking for some good coffee cupcake but then Saras told me to try the Hershey's chcolate cupcake which she also tried n relished way back. I heard it tasted heavenly , So went on ahead with no icing/frosting idea in my mind ..Seriously am not much of a fan and I discard those (mostly) when I have a cake..
Preheat the oven to 350 deg F. Line the cupcake pan with the cupcake covers. Mix together all the dry ingredients and then add the wet ingredient oil, milk ,vanilla ,eggs and beat on medium speed for 2 minutes using a mixer. Now add in the hot water and combine well . Now the batter would be very thin. Pour in the batter in the respective cupcake liners ( fill them 2/3 rd ) and bake for 30 to 35 minutes. Actually I made half the measurement and this would yield 13 to 14 cupcakes depends on the size of the pan. My oven took 17 minutes to finish baking 12 cupcakes. Better use a toothpick and insert in the middle of the cake when u cross over 15 minutes . If comes sout clean, then ur cake is done. If not, just check for every other minute till it's done. I don like frosting in general, so, used nutella for few cupcakes. Cupcakes look super rich in color. And i just can't stay away from nutella. Superb !! Wow.. Wow.. Woww... yummy and tempting recipe.. looks absolutely perfect !! thumbs up to the cup cakes n the nutella icing rocks ! Those cupcakes looks absolutely divine, salivating here..
Yummy & adorable cup cakes...!!! A chocolate lover`s delight!!! so wonderful cupcakes !! looks so delicious !! First time in your blog .... You have a nice collection of recipes. 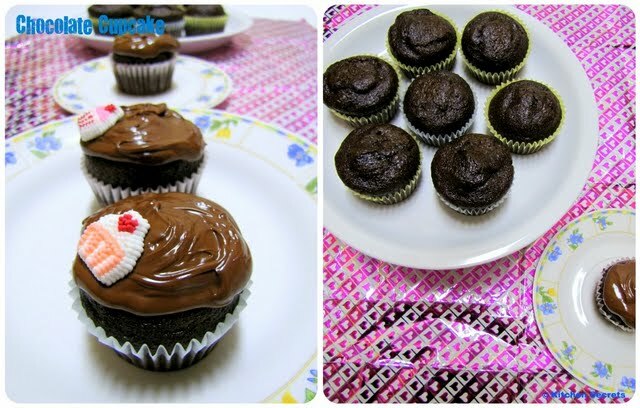 The chocolate cup cakes look sinfully delicious. I tasted these cuties, soo yummy & my son enjoyed it sho..Thanks for sharing..
Cup cakes look so rich and yummy with that topping! wow, they have come out so well, beautiful color on the top.